The Kid Who Would Be King reflects two hallmarks of Arthurian medievalism, the so-called Breton hope dating from the early twelfth century which promised that Arthur would return in Britain’s times of need, and continuing efforts to retell and reinvent any number of established Arthurian texts and tales for younger audiences, though Cormish’s film aims to be more than simply another example of Arthurian juvenilia. The director’s earlier film, Attack the Block (2011), had slightly older teens fending off invading aliens from outer space. 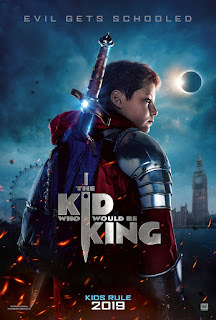 The Kid Who Would Be King repeats the same basic narrative thread, but the aliens are zombies buried with Morgana in her subterranean lair, and Earth’s defenders, here recast as Knights of the Round Table, are younger than their counterparts in Attack the Block. Film has embraced the idea of Arthur’s return in a time of need before. Marcel Varnel’s 1942 King Arthur Was Gentleman casts the well-known comic actor Arthur Askey as Arthur King, a somewhat timid recruit in His Majesty’s army who finds a sword that he thinks is Excalibur and that he then uses to rally the troops in a film which can be seen as part of Britain’s national war effort. Less interestingly, Richard Kurti’s lackluster 1994 comedy, Seaview Knights, reincarnates Arthur as a hapless taxi driver from Blackpool who sets off for London to save the country from the misrule of the Gray Knight (read John Major). Even more frequently, film has expanded the canon of Arthurian juvenilia. Examples include animated films such as Wolfgang Reitherman’s 1963 The Sword in the Stone and Frederik Du Chau’s 1998 Quest for Camelot; films with unexpected Arthurian connections such as Peter Werner’s 1995 Four Diamonds, Peter Chelsom’s 1998 The Mighty, and M. Night Shyamalan’s 1999 The Sixth Sense; and a number of films based on Twain’s Connecticut Yankee. The Kid Who Would Be King opens with an animated sequence retelling the medieval tale of Arthur from his pulling of the sword from the stone to his imprisoning of Morgana in a tangled subterranean lair. Arthur’s success is due to his ability to turn enemies into allies, and Arthur promises to return should England in the future find itself home to a fractured and leaderless society. The film then shifts to the present to tell the story of twelve-year old Alexander (Alex) Elliot (Louis Ashbourne Serkis), the victim, along with his friend Bedders (Dean Chaumoo), of repeated school bullying at the hands of Lance (Tom Taylor) and Kaye (Rhianna Dorris). In a nice touch, Alex lives on Malory Road. The film’s England is clearly more chaotic and unstable than it has been for centuries, and as Alex runs past a bank of newspaper boxes on his way to school, headline after headline proclaims that the situation is just as bad around the globe. Bedders is more readily the object of school bullying than Alex. He is pudgy and East Indian, while Lance is tall, blonde and blue eyed; and Kaye is tall, athletic, black, and female. Bedders sees parallels for his relationship with Alex in cultural reference points appropriate for someone their age: Star Wars, Lord of the Rings, Harry Potter, and even Shrek— The Kid Who Would Be King bridging cinematic genres at times to become an Arthurian buddy film as well. Taking a cue from the story of Arthur told in his favorite book, Alex attempts to make allies of his enemies, and sets up a new round table—once the leaves on the drop down table in Lance’s dining room are raised. The four decide to set out, with Merlin in all three of his forms in tow, for Tintagel, to find Alex’s long lost father, convinced that he will help them defeat Morgana. In keeping with Arthurian tradition, the four adopt a chivalric code that requires them to honor those whom they love, to refrain from wanton offense, to speak the truth at all times, and to persevere in any enterprise until the very end. The oath which they take to uphold their version of the code is not quite Sir Thomas Malory’s Pentecost Oath, but it will eventually serve a similar purpose in The Kid Who Would Be King to test the mettle of any would-be knight. From left to right: Lance, Bedders, Alex, the younger Merlin, and Kaye. Alex soon discovers that his father was haunted by demons—he was a violent drunkard—and abandoned him, the inscription in his Arthurian book having really been written by his mother (Mary Gough). At first disappointed, Alex rallies his classmates, and thanks to outfits purchased from a local costume shop, Pendragon Replica Weapons—located quite near the King Arthur’s Arms Pub and Inn—he leads his knights to Glastonbury Tor where they engage and, they think, defeat Morgana, who is only wounded rather than killed because Alex himself has violated the chivalric code in not honoring his mother by remaining angry with her for deceiving him about what really happened to his father. The older Merlin and Alex. The Kid Who Would Be King is filled with references to other examples of Arthuriana and to popular culture in general. A mother’s gift to her son of an Arthurian book informs Alan Crosland’s 1917 silent Knights of the Square Table. Merlin’s enlisting school children to save the world from a reawakened and vengeful Morgana is the plot of Robert Tinnell’s 1995 Kids of the Round Table—another film in which the hero is a bullied boy named Alex. Morgana’s underworld imprisonment recalls that of Merlin in John Boorman’s 1981 Excalibur. 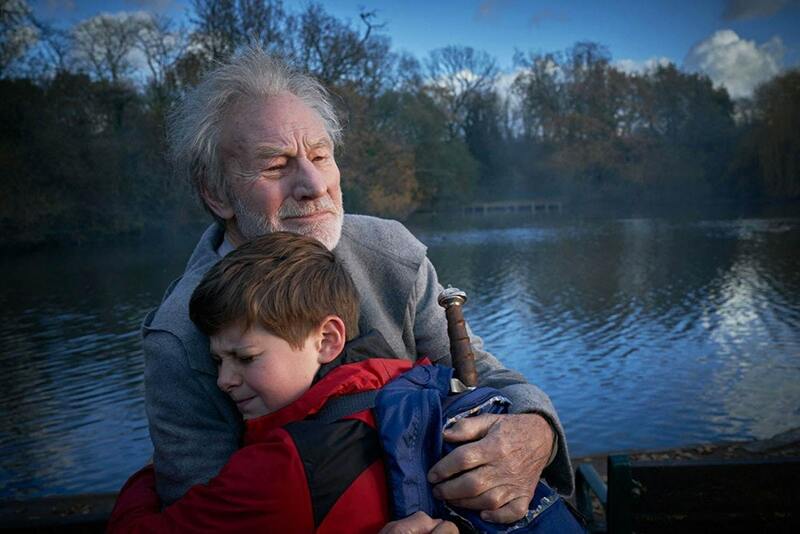 Boorman’s film is also the inspiration, minus the operatic accompaniment, for all but one of the scenes in The Kid Who Would Be King in which the Lady of the Lake retrieves or returns Excalibur. The exception, in which Excalibur pops up out of a bathtub, echoes a similar scene in David Bourla’s 1986 The Knight Before Christmas. The teenage Merlin uses an Arthurian take on the power of the Force from the Star Wars franchise to convince adults to do what he wants them to do. Both the younger and older Merlin sport Led Zepplin tee shirts in a nod to Guy Ritchie’s 2017 King Arthur, the trailer for which featured the band’s 1969 song “Babe I’m Gonna Leave You.” Bedders is dubbed Sir Bedders-vere. Ferguson’s Morgana is at first a diminutive harpy worthy of Ray Harryhausen and subsequently something much, much larger that seems to have escaped from Game of Thrones. Tintagel and Glastonbury Tor are, of course, meccas for Arthurian tourism. The politics of The Kid Who Would Be King are hardly subtle in light of current economic, political, religious and social upheavals both in Great Britain and across Europe that have fueled intolerance and suspicion and contributed to a rise in nationalism. And although Brexit is never directly mentioned, it too hangs over the film’s depiction of an England riven by factionalism and fear, and thus in need of Arthur’s promised return. The film’s antidote to such factionalism and fear is not especially profound or thought-provoking, but it does contain an unexpectedly royal echo. The reigning monarch has twice, in her annual Christmas message and in a more recent speech in Norfolk, called upon her subjects to adopt more civility and compromise in their public and private lives: "Every generation faces fresh challenges and opportunities. . . . As we look for new answers in the modern age, I for one prefer the tried and tested recipes, like speaking well of each other and respecting different points of view; coming together to seek out the common ground; and never losing sight of the bigger picture. . . . To me, these approaches are timeless, and I commend them to everyone.” (See the New York Times 26 January 2019: A4.) Cornish’s film issues a similar call for civility and compromise, though whether his young heroes will be able to change the course of public discourse any more successfully than Her Majesty the Queen is highly doubtful, especially given the film’s more than dismal initial box office receipts which, according to Variety, promise a loss of close to $50 million for 20th Century Fox. The Kid Who Would Be King directed and written by Joe Cornish; produced by Nira Park, Tim Bevan, and Eric Fellner; with Louis Ashbourne Serkis, Rebecca Ferguson, Patrick Stewart, Dean Chaumoo, Tom Taylor, Rhianna Dorris, Angus Imrie, and Mary Gough; a 20th Century Fox release, presented in association with TSG Entertainment, of a Working Title Films/Big Talk Pictures production. 2019. Running time: 120 minutes.